The second release of the Wine Green Spot series, following on from the Green Spot Chateau Leoville Barton released in 2015. 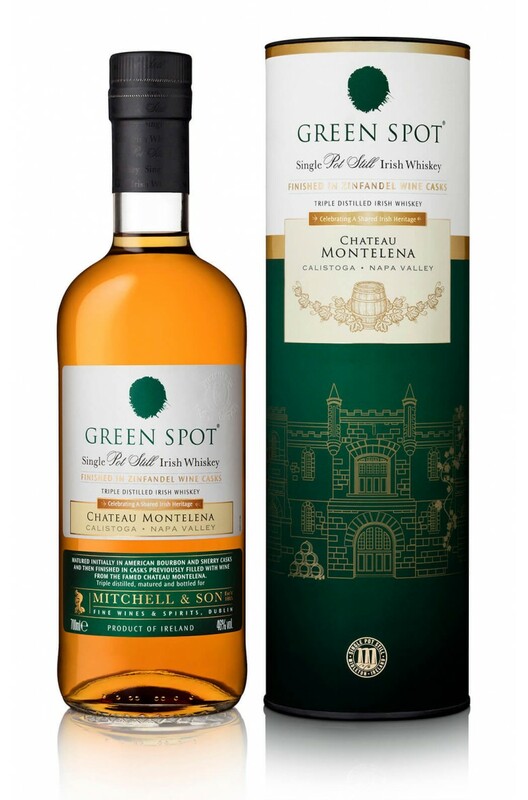 Initially matured in traditional Sherry and Bourbon casks, the Green Spot Chateau Montelena was then finished for an additional 12 months in French oak Zinfandel Wine casks, from the prestigious Chateau Montelena in Napa Valley. There is an abundance of marzipan and toasted oak which has undoubetly added to the complexity. Taste Sweet mouth coating takes on a dry note thanks to the effect of the wine cask. Pot still spices subside with zesty citrus leading to ripe orchard fruit and red berries. A touch of marzipan and toasted oak add to the complexity. Nose Crisp oak combines with the soft sweetness of vanilla, white chocolate and marshmallow, balanced with signature Green Spot red apples and ripe pears, along with pomegranate, cranberries and maraschino cherries, the contribution of the wine cask. Finish Satisfyingly long with pot still spices in harmony with the delicate dry wine contribution.